When it comes to major infrastructure projects in New York City, delays are almost expected. Here's a look at some of the biggest, from the World Trade Center Transportation Hub (delayed six years) to the Second Avenue Subway (decades and counting) and beyond. The Port Authority's hub was to be completely refurbished by the spring of 2013. The somewhat dingy interiors were to be transformed into a modern, 120,000-square-foot shopping area. Then the delays came, and the new terminal finally opened in June, 2017. The silver lining is that the developers, GWBBS Development Venture, were to cough up $5,000 every day the project is late, according to published reports. The grandiose, controversial project was originally scheduled to be open for service in 2009. While half of the Oculus opened in March, 2016, the rest of it, with the shops and street-level access from Church Street as well as the Dey Street passageway to Fulton Center, were open in June 2016. Two months later, most of the mall shops opened. By December, the World Trade Center subway connection to the E train was opened. The rest of the subway connections will open by 2018. Hopefully. The underground line along Second Avenue has been promised since the 1940s, but its current incarnation (first phase, three stations) was promised for 2014. It finally opened on Jan. 1, 2017. Phases 2 and 3 have no solid funding yet. Photo: These are the new tracks leading from the 63rd Street Station on the Second Avenue Subway Project. 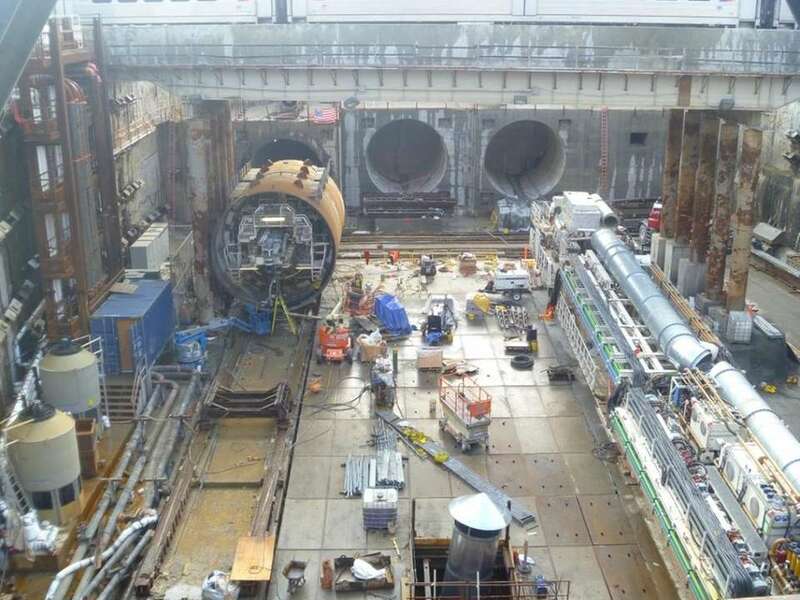 East Side Access is the project that will bring the Long Island Rail Road into Grand Central Terminal. In 1999 it was supposed to cost $4.3 billion and be completed by 2009. In 2003 it was supposed to cost $5.3 billion and be completed by 2011. In 2004 it was supposed to cost $6.3 billion and be completed by 2012. In 2009 it was supposed to cost $7.3 billion and be completed by 2016. In 2012 it was supposed to cost $8.3 billion and be completed by 2019. In 2014 it was supposed to cost $9.7 billion and be completed 2021. In 2015 it was supposed to cost $10.2 billion and be completed by 2022. Today, it's supposed to cost $11.2 billion and be completed by 2022. More here. Photo: The tunnel boring machine completed mining the third East Side Access tunnel to be built in Queens. This photo shows the machine being reassembled as crews prepared it for the tunnel mining operation. When the MTA awarded construction for the Hudson Yards on October 2007, the 7 Train extension was supposed to have two stations and a summer 2012 opening date for the expected Olympic Games. New York City wasn't awarded the games, and then the problems began. Mostly it was with the inclined elevator, but then the proposed station at 10th Avenue was nixed. The station finally opened on September 2015. The transit center, which makes changing stations for the 2, 3, 5, A, C and J trains much prettier, was to open in 2008. It included this very impressive Sky Reflector-Net, a series of mirrors to provide natural lighting to the main concourse. Fulton Center finally opened in November 2014, but soon thereafter several brand-new escalators stopped working. The plan to raise the bridge between Staten Island and New Jersey some 65 feet is central to the plans of the Port Authority of New York and New Jersey to expand the ports. The higher clearance would allow for bigger and taller container vessels to access Port Newark and the Elizabeth -- Port Authority Marine Terminal. Once again a harsh winter was blamed, and a project originally slated to finish by mid-2016 is now scheduled to wrap up by mid-2019. When first proposed in 2006, it seemed like a great idea for a small project -- a short bridge and footpath through government-owned land. But then things got complicated, since private companies were using the land and the railroad crossing became almost state of the art. After a summer of delays, the connector opened in November 2015. The reopening of the High Bridge as a pedestrian and bicycle crossing of the Harlem River seemed fairly simple. It was basically retrofitting an existing walkway (built in 1848 and closed to foot traffic in the 1970s), adding a chain link fence, handicap-access and a bike lane. And yet the opening was pushed from 2009 to June 2015, the Parks Department cited along the way "brutal" winter weather and "unanticipated factors." After the Sept 11, 2001, terror attacks, there were a few years delay before the David Childs design of the new One World Trade Center was approved. The open date slipped from 2008 to its official opening date of November 2014. The observation deck opened six months later.